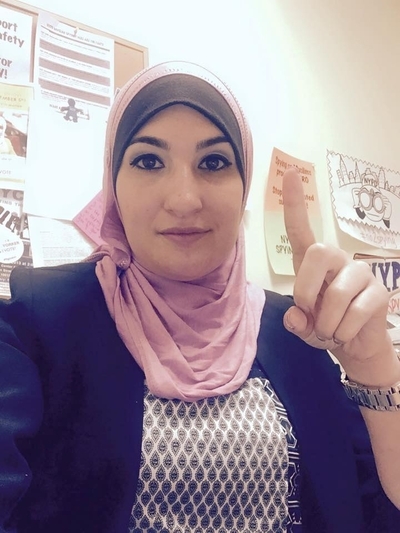 "...I learned about Sarsour's vicious attacks on Israel. She encouraged stoning the Israel Defense Forces. She posed for a photograph with Salah Sarsour, a Hamas operative jailed by the Israeli authorities in the 1990s. She acknowledges having many male relatives in Israeli prisons..."
In just over 24 hours, an online fundraiser encouraging Muslims to donate to repair vandalism at a Jewish cemetery has raised over $100,000. The LaunchGood.com fundraising page set up by Linda Sarsour of MPower Change and Celebrate Mercy's Tarek El-Messidi — garnered $20,000 in donations in its first three hours alone, shortly after being launched on Tuesday. "People in a cemetery should be able to rest in peace," Sarsour said on MSNBC Wednesday, telling Andrea Mitchell that she "expected nothing less from my community, who has always been a generous community." They launched the campaign after 180 gravestones were toppled, some broken, at the Chesed Shel Emeth Cemetery just outside of St. Louis, Missouri over the weekend. MIM: Arutz Sheva appears to have unquestioningly picked up this staged kumbaya "feel good" story ignoring the terror ties and Islamist agenda of Linda Sarsour and El-Messidi and appearing starstruck by J.K. Rowling. A fundraiser started by a pair of Muslim-American activists got a boost from famed Harry Potter author J.K. Rowling, raising tens of thousands of dollars to aid a Jewish cemetery that was vandalized over the weekend. Approximately 180 tombstones were knocked over at the Chesed Shel Emeth Society cemetery in the University City suburb of St. Louis, Missouri, according to police, who told AFP on Wednesday that they were still investigating the case and had no suspects. The act of vandalism occurred amidst a spate of anti-Semitic threats against Jewish groups across America. In response, Muslim-American activists Linda Sarsour and Tarek El-Messidi started an online campaign to raise funds for the cemetery's recovery and to "send a united message from the Jewish and Muslim communities." Rowling tweeted a link to a news article about the campaign on Tuesday night, adding simply: "This is such a beautiful thing." Within hours, the fundraiser appeared to have more than tripled its haul to over $70,000. Their initial goal was $20,000. Sarsour and El-Messidi planned to continue the fundraiser until March 20, and to send the proceeds to help the cemetery's recovery. Leftover funds would be donated to other Jewish groups. "There is no place for this type of hate, desecration and violence in America," the activists wrote on their fundraiser webpage. "We pray that this restores a sense of security and peace to the Jewish-American community who has undoubtedly been shaken by this event." The cemetery has received an outpouring of support, with Missouri Governor Eric Greitens announcing that he will lead a group of clean-up volunteers on Wednesday afternoon. "Anyone who would seek to divide us through an act of desecration will find instead that they unite us in shared determination," Greitens said in a written statement. Since the start of the year, the Jewish Community Center Association of North America has recorded 69 bomb threat incidents at dozens of centers in 27 US states and one Canadian province. On Monday alone, nearly a dozen Jewish community centers received bomb threats that prompted evacuations. All of the threats turned out to be hoaxes. After remaining silent on the subject for several days, President Donald Trump on Tuesday called for an end to "hatred in all of its very ugly forms." "...The people spotlighting Muslim attempts to repair desecrated cemeteries may think they're rebutting negative stereotypes. But they aren't. Sorry to say it, but Americans who fear or hate Muslims don't do so because they think Muslims tolerate vandalism. They do so because they think Muslims tolerate terrorism. These stories will not dent that perception. Americans are rightly proud of the way its citizens of many groups came together to help one group among them recover in a time of distress – and Muslims should be part of that celebration. But breathless reports that American Muslims aren't jackasses after all help nobody…"
MIM:More perverse kumbaya on the part of Jews who are helping to rebuild a radical mosque.